This is for information purposes only. DO NOT LEAVE MESSAGES! We are always looking for enthusiastic new members to strengthen our programs. community and having fun doing so! * There is an additional $30 non-resident fee required by the City of Miramar..
* Non-resident fee will be waived for active duty military personnel & City of Miramar employees. We just wanted to thank all of you who coach. We often forget that these positions are voluntary and that you often share your evenings and weekends with our children. We feel fortunate that there are people like you who share your talents and offer your time to the kids of our community. Coaching is a lot of hard work and we thank you for your sharing your expertise with our children. We truly appreciate all you do. 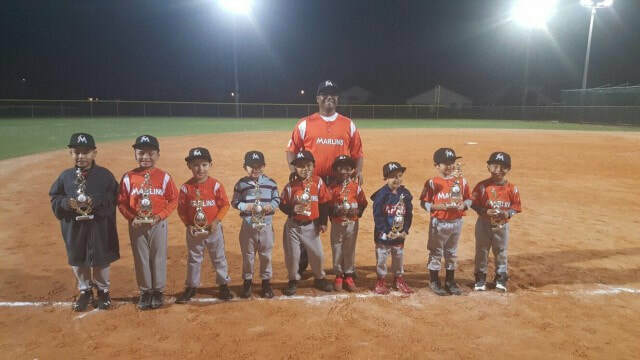 So to all of you who have ever coached our kids at Miramar Optimist Baseball. Thank you! Thank You to all the coaches/assistant coaches, sponsors as well as team parents for all your help and support.